A wild Jekyll & Hyde performance by the Bucs’ offense was led by an erratic display from quarterback Ryan Fitzpatrick. His good production was paired with wild inaccuracy and dubious decision making. The yardage figures were good, but Fitzpatrick and the rest of the Tampa Bay offense simply couldn’t finish a drive in this game without making a pivotal mistake. Peyton Barber had become the forgotten man in the Bucs’ offense, but early in the game, he proved to be more than a dependable change of pace on the ground, as he picked up more than half of his yards after contact and broke handful of tackles on the afternoon. As has been the case much of this season, Gerald McCoy seemed like the only Buccaneer defensive lineman who could cause any disruption for them. He had a sack as well as a few more pressures and was a presence in the run game. A surprising bright spot for the Bucs was the strong game by slot corner Andrew Adams. He came on in sub packages and was only targeted a few times. He allowed a couple of underneath catches for very minimal gains and made a nice pass breakup while covering tight end Jordan Reed. It was a solid but very unspectacular day for Alex Smith and the Redskins passing offense. Smith did what he does best; he made safe throws and never put the ball in danger. He only misfired on a handful of passes, most of which were deep throws. They were safe misses, but they were throws he should’ve made and throws that would’ve put this game out of reach much earlier. Much was made about the Redskins makeshift offensive line after injuries have decimated it, but they actually played well. Smith held onto the ball late on a large number of passing plays and yet was rarely pressured. They also opened plenty of holes for Adrian Peterson and Kapri Bibbs to run through. While the Bucs were able to pick on Washington’s corners at will, their elite safety pairing showed their quality once again. Both D.J. Swearinger and Ha Ha Clinton-Dix were stingy in coverage, and offered precious little to the tight ends and receivers they were covering, contesting plenty of passes and breaking up at least one pass apiece. The Washington pass-rush didn’t get home consistently, but they came into the game as the clock wound down. Jonathan Allen and Preston Smith led the way with multiple pressures and Smith came up late in the game with a sack that eventually resulted in a fumble. 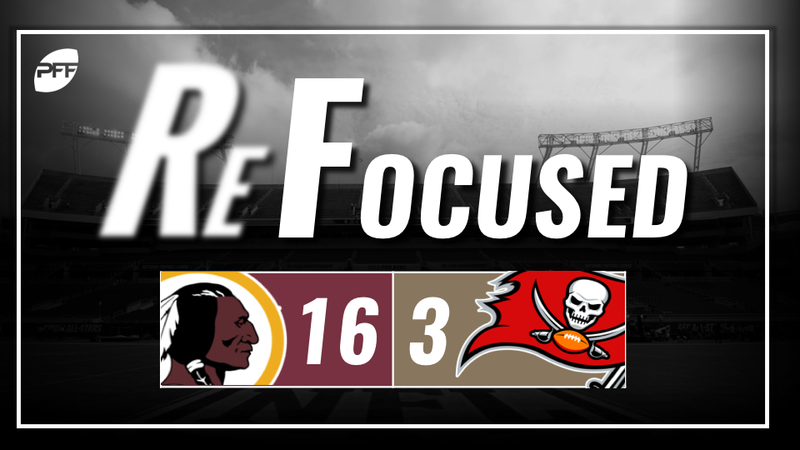 Tampa Bay: The Bucs had the production to stay with Washington, but their inability to take the points that were within their grasp saw them fall to another agonizing defeat. Washington: The Redskins came away with the win because their defense was able to create some very timely turnovers that made up for their offensive struggles.